*Assumes 1.5-foot shelf depth with shelving along both long walls. While you can technically make a perfect shelving system that creates more space, these conservative calculations are based in designs that we have found to be cost-effective and practical for accommodating features like doors and climate control units. The numbers above are calculated using the interior dimensions of shipping containers. When using these numbers to determine what you can store in your container, we recommend using a packing efficiency modifier because it’s nearly impossible to use every square inch of space. For example, if you need to gauge the volume of dry goods you can fit in a container with shelves, multiply the volumetric shelf space by a packing efficiency modifier of .8 or .7 to create a realistic estimate. To give you a sense of scale here are some calculations we’ve made. 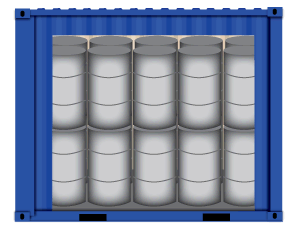 How many oil drums can you fit inside a container? If you use every possible inch of space, how many banker’s boxes can you fit inside a container? One twenty-foot container is 160 square feet - about the size of the smallest legal apartment in San Francisco. A 40-foot container could fit two Volkswagen Beetles with room to spare. Storage containers can be modified to provide proper storage for a wide range of products. For instance, containers used for restaurant inventory storage usually include climate control features. Custom shelving and cabinetry also keep storage tidy. Whatever you plan to store, it will be secure inside a container, just review the chart above to make sure it will fit. Blog: Configuration Inspiration for Onsite Storage Containers. Blog: Insulating your Shipping Container Structure. Guide: Examples and Explanations of Shipping Container Modifications. Questions? Contact us at sales@falconstructures.com or 877-393-4219.